For other uses, see Wide receiver (disambiguation). "Split end" redirects here. For split ends in hair, see Trichoptilosis. For other uses, see Split Ends (disambiguation). An example of a wide receiver's positioning in an offensive formation: Split End (SE), Slot Back (SB), Slot Receiver (SR), and Flanker (FL) position. A wide receiver is an offensive position in American and Canadian football, and is the key player in most of the passing plays. Wide receivers are among the fastest players on the field. Only players in the backfield or the ends on the line are eligible to catch a forward pass. The two players who begin play at the ends of the offensive line are eligible receivers, as are all players in the backfield. The backs and ends who are relatively near the sidelines are referred to as "wide" receivers. At the start of play, one wide receiver may begin play in the backfield, at least a yard behind the line of scrimmage. Such positioning allows another player, usually the tight end, to become the eligible receiver on that side of the line. Such positioning defines the strong side of the field. The wide receiver (WR) is a position in American and Canadian football that functions as the pass-catching specialist. Wide receivers (also referred to as wideouts or simply receivers) are among the fastest and most agile players in the game, and they are frequent highlight-reel favorites. Examples of wide receivers include Don Hutson, Jerry Rice, Steve Largent, Steve Smith Sr., Randy Moss, Larry Fitzgerald, Calvin Johnson, and Tommy McDonald. The wide receiver's principal role is to catch passes from the quarterback. On passing plays, the receiver attempts to avoid, outmaneuver, or simply outrun defenders (typically cornerbacks and/or safeties) in the area of his pass route. If the receiver becomes open, or has an unobstructed path to the destination of a catch, he may then become the quarterback's target. Once a pass is thrown in his direction, the receiver's goal is to first catch the ball and then attempt to run downfield. Some receivers are perceived as a deep threat because of their flat-out speed, while others may be possession receivers known for not dropping passes, running crossing routes across the middle of the field, and generally, converting third down situations. A receiver's height and weight also contribute to his expected role; tall height and light weight are advantages at the receiver position. A wide receiver has two potential roles during running plays. Particularly in the case of draw plays and other trick plays, he may run a pass route with the intent of drawing off defenders. Alternatively, he may block normally for the running back. 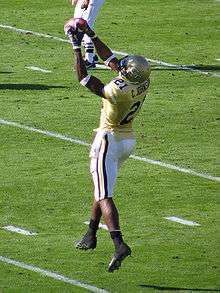 Well-rounded receivers are noted for blocking defensive backs in support of teammates in addition to their pass-catching abilities. Sometimes wide receivers are used to run the ball, usually in some form of end-around or reverse. This can be effective because the defense usually does not expect them to be the ball carrier on running plays. For example, wide receiver Jerry Rice rushed the ball 87 times for 645 yards and 10 touchdowns in his 20 NFL seasons. In even rarer cases, receivers may pass the ball as part of a trick play. Despite the infrequency of these plays, some receivers have proven to be capable passers, particularly those with prior experience as a quarterback. An example where wide receiver and quarterback even swapped roles was Kansas City Chiefs' Wide receiver Mark Bradley's 37-yard touchdown pass to Quarterback Tyler Thigpen against the Tampa Bay Buccaneers on November 2, 2008. Wide receivers also serve on special teams as return men on kickoffs and punts, or as part of the hands team during onside kicks. Backup receivers could also serve as gunners on special teams. Finally, on errant passes, receivers must frequently play a defensive role by attempting to prevent an interception. If a pass is intercepted, receivers must use their speed to chase down and tackle the ball carrier to prevent him from returning the ball for a long gain or a touchdown. In the NFL, wide receivers can use the numbers 10–19 and 80–89. Split end (X or SE): A receiver on the line of scrimmage, necessary to meet the rule requiring seven such players at snap. Where applicable, this receiver is on the opposite side of the tight end. The split end is farthest from center on his side of the field. Flanker (Z or FL or 6 back): A receiver lining up behind the line of scrimmage. Frequently the team's featured receiver, the flanker uses the initial buffer between himself and a defender to avoid immediate "jamming" (legal defensive contact within five yards of the line of scrimmage). The flanker is generally on the same side of the formation as a tight end. As with the split end, this receiver is the farthest player from the center on his side of the field. The flanker is usually lined up just like a split end except that he is just behind the line of scrimmage, therefore being in the backfield and not on the line. Slot receiver (Y or SR): A less-formal name given to receivers in addition to split ends and flankers (for example, tight ends who line up wide). These receivers line up between the split end/flanker and the linemen. If aligned with a flanker, the slot receiver is usually on the line of scrimmage, and if with a split end, off the line of scrimmage. As with the flanker position, a featured receiver often takes a slot position with a split end to avoid jamming. Slot back: A receiver lining up in the offensive back field. Canadian and arena football allow them to take a running start at the line. They are usually larger players as they need to make catches over the middle. In American football slot backs are typically used in flexbone or other triple option offenses while Canadian football uses them in almost all formations.